CATS AND OTHER ANOMALIES: WELCOME BACK TO ME! Fun and informative blog about cats and other strange things that happen in life. Well, I see it's been a long time since we blogged. October, in fact. My mother was in the hospital and rehab for a month in October 2009 (she's fine now) and the day before Thanksgiving (after being misdiagosed four times by four different doctors as having pneumonia), I was hospitalized in intensive care with multiple pulmonary emboli (blood clots in my lungs). I was fortunate to be alive and after spending 6 days in the hospital, was released and spent several more months recovery. I am now back to work and getting healthier every day. 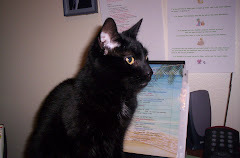 Pieper the little black cat is doing well, as is my son, Steve. He is back to work after having faced a layoff in the Spring. Promise to keep you all more up to date on our little escapades. Get the PIEPER'S PLACE @ BONANZLE widget and many other great free widgets at Widgetbox! A Denver, Colorado Native. A cat lover forever, although while I was married, I was unable to have a cat. So first thing upon getting that divorce, I got the real Pieper. I work at the local police department in Records & Evidence, 4-10's on the late swing shift. Been there for eight interesting years.